To be impactful and successfully generate the necessary level of employee engagement, a reward system must include the components of compensation, benefits, recognition, and appreciation. The focus of many programs today is on the first two, and the latter two to a lesser extent, if at all. These two are more likely to facilitate the generation of intrinsic rewards, which will lead to greater employee engagement. The generation of intrinsic rewards may often be accomplished at a lower cost to the employer. A simple, deserved “Thank You” can generate amazing emotional results if it reflects the leader’s true feelings. Intrinsic rewards are internal in nature and are focused on things that bring feelings of personal satisfaction, esteem, autonomy, self-actualization, personal growth, a sense of accomplishment or a feeling of confidence. They’re not like paychecks or bonuses; they can’t be simply “given” to employees to increase engagement. They’re at the heart of the job performed. It’s the nature of the work and how the employee perceives their role within the organization and its value to the organization’s success. What “good,” as viewed by the employee, is being accomplished? that generate intrinsic rewards will be done without compensation. Playing games, eating, laughing, family time, traveling, exercise, entertainment, and sporting events and activities are commonly and happily done without pay. Often individuals will donate their work and skills for the greater good. Examples are volunteer work, free legal clinics, and doctors traveling to third world countries to help the needy. Leaders must structure jobs to provide an outlet for intrinsic needs to promote job satisfaction and increased productivity. Keeping employees involved and focused is the goal. Many employers are making the workplace “more fun” to deal with the needs of younger workers. Contests, competitions, group activities may be helpful. There may be jobs or tasks that don’t readily suggest the availability of intrinsic rewards. Menial or repetitive tasks are examples. But leaders can help instill a sense of pride and feelings of accomplishment for jobs well done, regardless of the tasks. The key is ensuring the employee is recognized for quality work. The best leaders will identify ways to provide intrinsic rewards to their employees by allowing and motivating them to complete activities they find rewarding. One poll shows only 33 percent of employees are ‘engaged” in their job, at a great cost to the economy in lost productivity. Leadership must make employee engagement a high priority. And more money isn’t necessarily the solution. Leaders must help team members understand their own value and how it impacts the organization and value employee input and suggestions. They should reduce obstacles to their team members’ productive success. Management should create a work environment with greater flexibility as a key to generating intrinsic rewards, a key to employee engagement. The sense that an employee has some control of their own activities and their work environment can generate substantial intrinsic rewards. Despite the nearly universal acceptance of employee recognition as a highly motivating factor, only 25 percent of leaders have a recognition strategy. Regular demonstrations of appreciation for valuable work and related group recognition are other ways to generate intrinsic rewards. If employers can structure jobs and the treatment of employees to facilitate the generation of intrinsic rewards, all parties benefit. The employee has greater job satisfaction and may be less insistent on higher pay. The employer may see greater productivity from the employee, and benefit from the increased involvement of the team members in generating ideas and problem solving. It can also increase employee retention and provide a greatly improved work environment for the entire team. Naturally money is always an important consideration. But there are many factors that can enhance employee satisfaction and engagement. Flexible time off is always a key benefit. Many jobs are filled by employees who are students or have other tasks to perform. The ability to generate income while they can continue other life goals can be very important. Another is offering training to improve their work or life skills. The team must believe the employer is concerned about their well-being and success by encouraging feedback and taking time to listen. Help them understand what’s expected of them, what great performance looks like, and show them what their future may be within the organization. Another very common problem is the difficulty of finding and keeping quality people and the related cost of replacement. A cooperative and rewarding work environment can significantly reduce turnover and extrinsic rewards can be given for less than the extraordinary cost of employee replacement. Identify and provide rewards that have unique value to the receiver. A customized reward system can save money and have a much greater satisfaction impact than “standard” rewards. There is a clear and compelling relationship between employee reward systems and the level of employee engagement. And the greater motivation is derived when these rewards can be provided or created in a way that generates intrinsic rewards within the employee. Motivated and engaged employees lead to dedicated customers as well as company success. In the simplest of descriptions, employees want to make as much as they can for the effort (productivity) they offer. And employers want to pay as little as possible for the productivity they need. Through a variety of factors including market conditions, employment levels, required skills levels and similar criteria, the two parties come to an agreement of what level of rewards will be offered for the required productivity. Typically, these are extrinsic rewards offered by the employer to the employee. 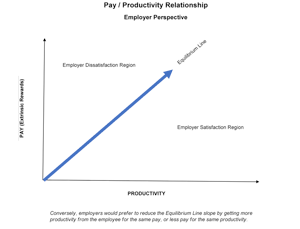 This level of agreement between the two parties can be viewed as the “Equilibrium Line (EL)” as graphed in Figure 1. This figure represents the employee’s perspective relative to how activities “outside” the EL are perceived. Figure 2 represents the same relationship from the employer’s perspective. 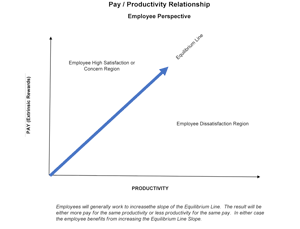 For activities outside the EL, this graph could be perceived as the exact opposite of the employee’s perspective from Figure 1. 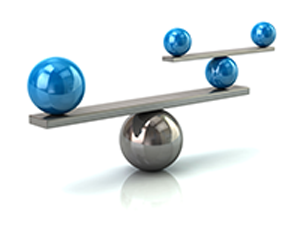 The two groups have conflicting goals. 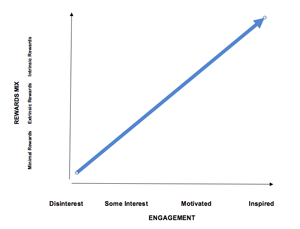 Figure 3 represents the effect of the introduction of the value of the intrinsic rewards as perceived by the employee. 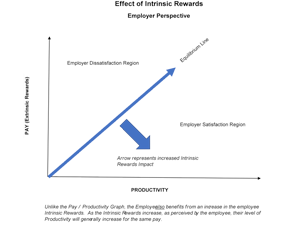 Figure 4 represents the effect of the introduction of the value of the intrinsic rewards as perceived by the employer. The key point here is that rather than the conflicting goals reflected in Figures 1 and 2, Figures 3 and 4 are complementary in that both the employee and employer benefit by the introduction of intrinsic rewards to employee. 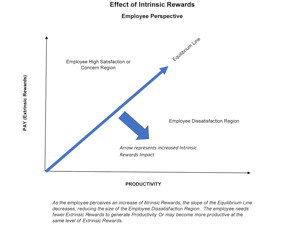 Figure 5 extends the relationship of rewards and productivity and proposes a similar relationship between the reward mix (of extrinsic and intrinsic) and the level of employee engagement. 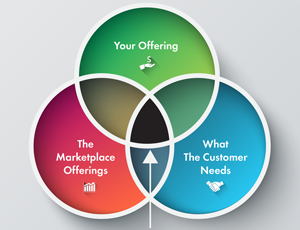 The “optimal” mix that generates the highest level of employee engagement varies by employee. But generally, the higher the level of intrinsic rewards, the greater the employment engagement level. And both the employee and employer benefit by this higher level of intrinsic reward. When you expand the Pay axis to include the Extrinsic and Intrinsic Reward Mix, we can generally see an increase in Employee Engagement. The most effective “Mix” of Extrinsic and Intrinsic Rewards to maximize Productivity is employee/role specific. There is no standard “perfect” mix. But absolutely, the employer is motivated to increase the employee’s Intrinsic Rewards to the employer’s benefit.